Framer Framed is happy to welcome Papuan artist and painter Ignasius Dicky Takndare to the Netherlands, as part of the current group exhibition Pressing Matters (30 March – 27 May at Framer Framed). The exhibition addresses urgent socio-political issues in Indonesia, with a special focus on the current situation in Papua. After the Dutch colonisation of Papua and the declaration of Indonesian independence in 1945, Papua was claimed by Indonesia as one of its provinces. Presently, human rights violation cases there have reached a critical level, but most still remain unnoticed or unaddressed by the government. The indigenous population is cornered by many threats to their lives and livelihoods, including military violence, limited access to healthcare, forced displacement as a result of the mining industry, and an increase in migrant workers from Java and elsewhere. Moreover, with the Indonesian state’s restriction of media access, the area has become one of the most isolated places in the world. In Takndare’s work, issues of Papuan people and identity take centre stage, focusing on how indigenous Papuans have transformed as a result of political changes. He uses his brush as a voice and his work as a scream to draw attention and to articulate a real threat: ‘We do not want to go extinct in silence’. Join us for this special opportunity to learn more about Takndare’s artistic and activist practice. 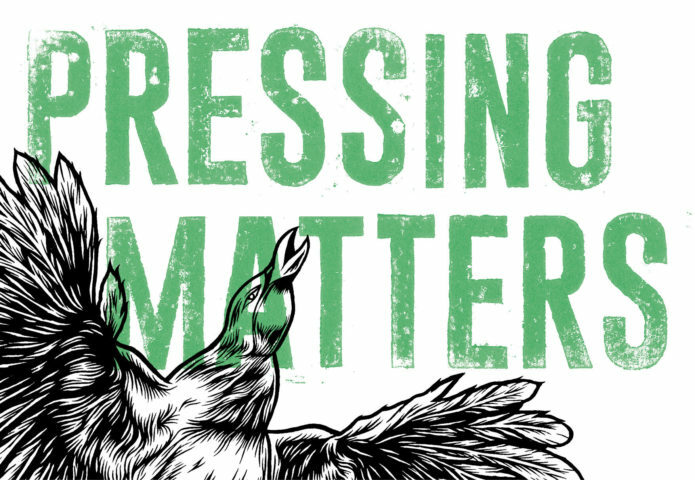 The event will take shape as a special tour and discussion through the Pressing Matters exhibition with Takndare, cultural historian Nancy Jouwe and exhibition initiator and artist Kevin van Braak. Prior to this event, Ignasius Dicky Takndare will also speak as part of the summer opening of the Tolhuistuin garden, on Wednesday 9 May, 20:00. Check out the full program here. 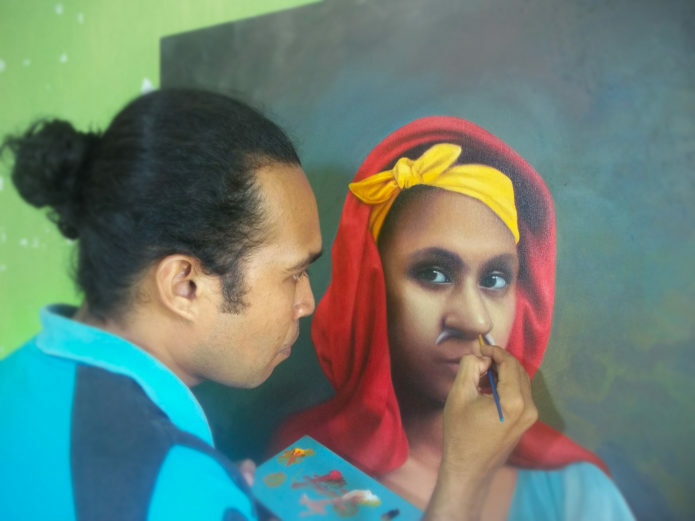 Ignasius Dicky Takndare is a Papuan artist born in 1988 in Sentani, Jayapura. He is a Fine Arts graduate from Indonesian Institute of the Arts (ISI) Yogyakarta, and the owner of Onomi Art Design and Phuyakha Art Studio. His career in the practice of painting took off after he was awarded the First Prize of the Indonesia Panorama Drawing Competition held by Galeri Nasional Indonesia. 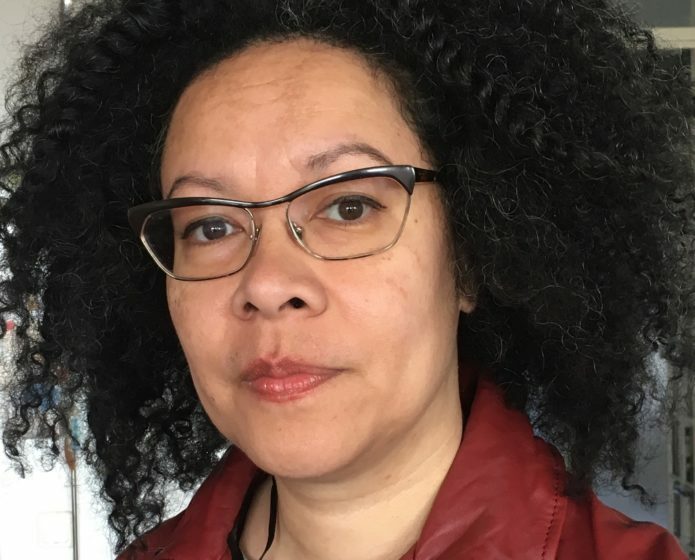 Nancy Jouwe (Delft, 1967) is a lecturer, researcher and public speaker, active since 1993 in the NGO sector as a manager, director and cultural producer, with a focus on intersectionality, colonial history, arts, heritage and intercultural dialogue. She co-founded Framer Framed and stood at the basis of research project Mapping Slavery, a transnational research project that maps the Dutch colonial history of slavery. As an activist she’s been involved in the ‘80s and ‘90s with local squatters and transnational queer, indigenous, and women’s movements, incl. in SE Asia and the South Pacific. She comes from a family of political refugees that had to flee Indonesia in the beginning of the 60s, as her father was a political leader in the Papuan independence movement. She wrote extensively about Papuan issues, including women’s rights and the Papuan diaspora. Kevin van Braak is an artist born in 1975 in Warnsveld, the Netherlands. He has exhibited internationally, among others recently in Sonsbeek 2016: Transaction. 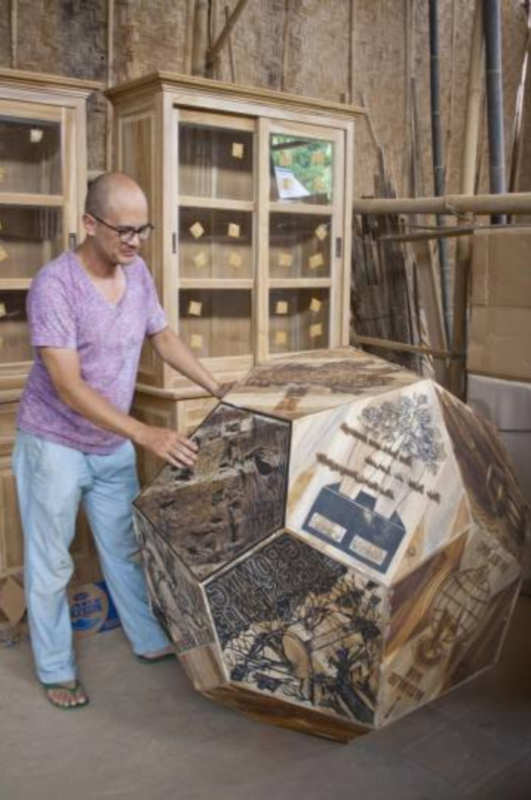 Van Braak’s work is set around politically and ideologically problematic issues. In recent years, he turned his attention to the visibility and invisibility of the display of power in buildings, people, location, and artifacts and how our historical consciousness functions in relation to the history behind it. The exhibition Pressing Matters at Framer Framed started with an artistic research journey into his own past, retracing the steps of his Indonesian grandfather. The visit of Ignasius Dicky Takndare is made possible by the Prince Claus Fund.